Introducing the LDC500 Series Laser Diode Controllers — highly stable, low-noise current sources, with integrated temperature controllers — all at very affordable prices. The LDC500 series are the ideal instruments for controlling the current and temperature of your laser diodes. They have the performance and features you expect from instruments costing twice as much. Introducing the LDC500 Series Laser Diode Controllers — highly stable, low-noise current sources, with integrated temperature controllers — all at very affordable prices. 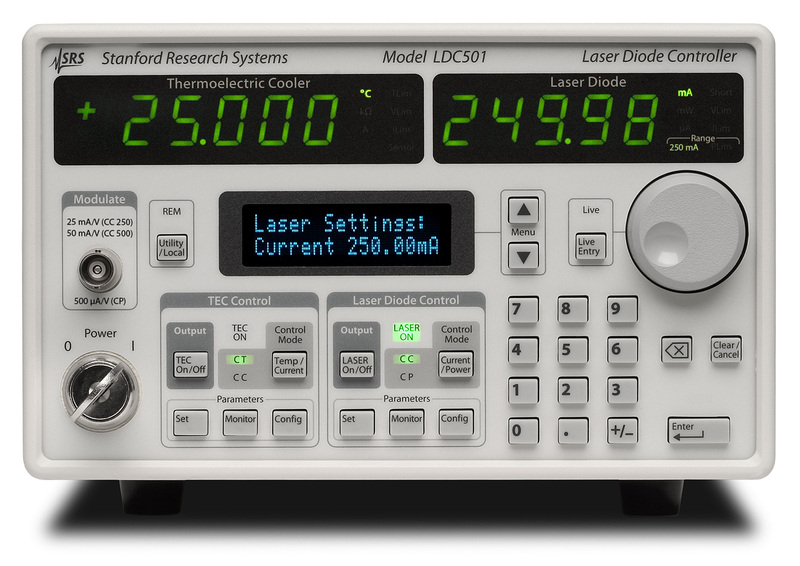 The LDC500 series are the ideal instruments for controlling the current and temperature of your laser diodes. They have the performance and features you expect from instruments costing twice as much. The LDC501 has up to 500 mA of output current with less than 1.1 µA of rms noise, while the LDC500 has up to 100 mA of current and less than 0.3 µA of noise. The LDC502 provides up to 2 A of current. 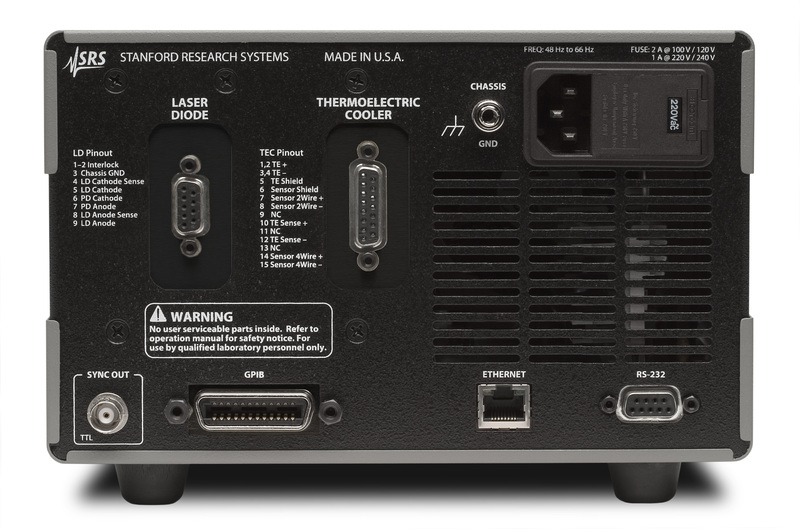 With a low-noise current source, a 36 W high-precision temperature controller, and standard computer interfaces including Ethernet, the LDC500 series is the right choice for your laser diode testing and control applications. The LDC500 series have an intuitive user interface, and many first time users will be able to operate the instrument without having to crack open the manual (although we do recommend reading the manual). Unlike competitive models, the LDC500 series controllers have a dedicated front-panel display for parameter entry. You don’t have to sacrifice monitoring temperature or current to simply change an instrument setting — you have a separate two-line, blue alpha-numeric display for that. In addition, bright 5-digit green LED displays constantly monitor current and temperature, and are large enough to easily read from anywhere in the lab. Multiple laser diode protection features, including slow start turn-on, adjustable current limits, and adjustable compliance voltage, keep your laser diodes safe when unexpected events occur. Fast clamping and shut down provide extra protection against intermittent contact with the laser. Combined, these features provide trouble-free, safe control of your laser diode. Independent linear power supplies are used for the laser diode controller and the temperature controller. The supplies are designed with a magnetically shielded toroidal transformer, and provide ultra-clean, stable isolated power. Remote operation of the LDC500 series is supported with GPIB, RS-232 and Ethernet interfaces. All instrument functions can be controlled and read over any of the interfaces. Up to nine complete instrument configurations can be saved in non-volatile RAM and recalled at any time. A TTL trigger output is also available to synchronize other test equipment. To ensure a stable optical output from your laser diode, the LDC500 series LD controllers were designed to deliver noise-free, precision operation. They are accurate to ±0.01 % FS, have automated testing setups, noise is as low as 0.3 µA rms, and they meet a drift specification of 10 ppm/°C. The controller have two modes of operation for the laser diode: constant current and constant power. Constant current mode (CC) programs the source to a precise DC amplitude. Alternatively, the constant optical power mode (CP) servos the current source to maintain a constant signal on a monitor photodiode. Both control modes allow you to add an external modulation signal, with adjustable bandwidth up to 1 MHz (in CC mode) or 10 kHz (in CP mode). Another convenient feature that the LDC500 series offers is a fully programmable photodiode bias voltage. You can set the bias between 0 and 5 V from the front panel, or remotely using one of the computer interfaces. A unique feature of the LDC500 series is dynamic “Bumpless Transfer” between CC and CP modes. This feature means you don’t have to shut down your laser to switch modes — simply press the Current/Power button. The LDC500 series integrated 36 W temperature controller lets you adjust temperature with 0.001 °C resolution, and measure temperature with 0.01 °C accuracy (with a calibrated sensor). It maintains a typical stability of 0.0005 °C/°C with respect to room temperature, and has a very wide temperature control range. The TEC controller also has two modes of operation: constant temperature mode (CT) controls the TEC current to maintain a fixed temperature (or raw sensor value), while constant current mode (CC) operates the TEC at a fixed current. Thermistor, RTD and IC sensors are all supported. The LDC500 series offers an auto-tuning feature which automatically optimizes the PID loop parameters of the controller. Of course, full manual control is provided too. Dynamic transfer between CT and CC modes for the TEC is also easy — just press the Temp/Current button. Temperature fluctuations in a typical laboratory environment can often exceed several degrees Celsius over the course of a day. Small temperature changes can mean significant current changes in your laser diode if your controller is not up to the task. The LDC500, LDC501 and LDC502 have a temperature coefficient of 10 ppm/°C, which is a factor of five better than competing models, making it the ideal controller for precision laser diode experiments. The graphs below demonstrate the temperature performance of the LDC500 series. Over a 24 hour period, the ambient temperature change in the laboratory exceeds two degrees Celsius. Note that the output current deviation of the LDC after warm-up is stable to better than ±10 ppm. Input impedance 2 kΩ, typ.